The mortal race (those who worship the false Gods of the lower world and are destined to be destroyed at the end of the age) and the immortal race (those who recognize their own spiritual nature and turn to the true God above). "Teacher, 'you' are [.....] the Son of our God," they said. Whenever Jesus laughs in the 'Gospel of Judas', he is about to correct errors in someone's thinking. In this instance, Jesus's laughter is a kind of ridicule or mockery intended to shock the disciples out of their complacency and false pride. Their deepest problem is that they don't know they have a problem; they wrongly think they are already righteous, with their prayers and practices of piety. Jesus tries to teach them that they are not worshipping the true God. At first they are astonished, not understanding, and they insist (wrongly) that Jesus is the Son of"our"God. The very fact that they are celebrating the eucharist shows that they are wrong in their understanding that God demands Jesus's death as a sacrifice. The author of the 'Gospel of Judas' is reading the situation of his own day back into the gospel story, since Christians did not celebrate the eucharist as a sacrificial meal until after Jesus's death. But the author's point here is that Jesus himself opposed this (later) practice, because it misconstrued the true meaning of his death, as the author sees it. When Jesus declares that none of his disciples ("no race from the people among you") will ever know him, he is saying that people who consider themselves to be"children"of the false"God"Will never be able to perceive who Jesus is - that he is the Son of the true God above. The term the author uses here is 'genos', which could be translated"kind," "people," or"race.”Contrary to the notion that Christians broke down barriers of race, class, and gender (as in 'Galatians' 3:28," There is no longer Jew or Greek, there is no longer slave or free, there is no longer male or female; for all of you are one in Christ Jesus"), they continued to use the language of ethnic and racial identity to understand Christians as a people, often calling themselves"A third race.”This language of"race" appears frequently in the 'Gospel of Judas'. Although the author often uses the plural"human races," in essence only two races exist: the mortal race (those who worship the false Gods of the lower world and are destined to be destroyed at the end of the age) and the immortal race (those who recognize their own spiritual nature and turn to the true God above). A similar idea is stated clearly in another book from Nag Hammadi, the 'Sophia of Jesus Christ', in which Jesus teaches that" (e)verything that came from the perishable will perish, since it came from the perishable. But whatever came from the imperishable does not perish but becomes imperishable. So, many people went astray because they had not known this difference and they died" (III.98:1-9). Death, it would seem, is not inevitable, but a result of not learning how to distinguish between the mortal world where people live now and the eternal world above. Since humanity is created in the image of the divine Adamas above - in that sense, people come from the imperishable - they are capable of becoming imperishable. 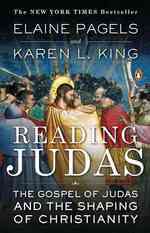 (P.132) Here we get the first indication of why Jesus promotes Judas over the others. He alone recognizes who Jesus really is: "I know who you are and which place you came from.”In the New Testament gospels as well, the disciples struggle and often fail to understand Jesus's true identity. For example, in the 'Gospel of Mark', only Peter understands that Jesus is the Christ; but even he rejects Jesus's crucifixion, and Jesus turns on him, calling him Satan and charging," You are setting your mind not on divine things but on human things" ('Mark' 8:27-33). (P.133) Jesus's disciples in the 'Gospel of John' also fail to recognize Jesus; even though they claim they have understood, at the end, they all desert him - and Peter actually denies him three times ('John' 14:1-11; 16:28-32; 18:15-27). Like the disciples in the 'Gospel of John', who flee at Jesus's arrest, the disciples in the 'Gospel of Judas' are afraid: proof that they do not really believe, because they do not really understand who Jesus is and where he comes from. The term translated"realm"here is 'eon', which means"A period of time"," an age"," a lifetime.” In adverbial form, 'aionios', it means"eternity.” The term appears frequently in the 'Gospel of Judas' to refer both to the immortal, eternal realm above and to the mortal, limited realm below. It thus has a very strong spatial as well as temporal connotation. In other Christian texts, the term is also sometimes personified, so that it refers to a kind of eternal being - like angels or archangels - but here the main sense is a realm that exists with regard to a period of time (whether limited or eternal). If people turn inward and come to know their inner spirit ... their souls live on with the immortal spirit given by God. Judas's next question," Does the human spirit die?," shows that he is beginning to understand. The body will die and the world will perish, but the spirit does not belong to this perishable realm but to the world above. What will happen to it at the end of time? The divine spirit cannot perish, but the 'Gospel of Judas' assumes the death of the physical body and its finality. Moreover, it teaches that even souls are mortal unless they are joined with immortal spirits. Jesus has already told Judas that the souls of everyone who belongs solely to the human race will die (8:2). But here Judas asks about the spirit, not the body or the soul. Jesus's answer to his question is complex. He says that God commanded the angel Michael only to loan spirits to human beings, so that they might worship God for the time allotted to their kingdom (with its ruler). But when that time is over, their worship comes to an end and they die (body and soul). But, Jesus says, others receive a spirit from another angel, Gabriel, so that when their bodies die, their souls remain alive and are lifted up to the heavenly realm. These received the spirits of the great undominated race: that is to say, spirits from the kingdom above, where the rulers of chaos cannot lord over them. Those with immortal spirits will dwell above forever in the holy place reserved for them (8:3-4; 13:12-13). Thus, in the end, the souls of those who worship the angelic rulers of the lower world perish along with them, while the souls of those who turn toward the world above remain united with the spirit and are lifted up to join the holy race on high.